Welcome to Ebb & Flow – your perfect beach vacation home getaway. 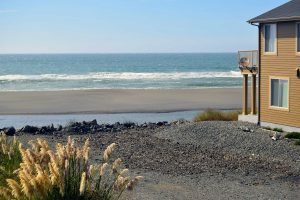 In this three bedroom home you’ll find a nicely furnished and perfectly appointed home for your next Gold Beach vacation – all within a short walking distance to miles of pristine beach. The up/down floorplan includes two guest bedrooms on the downstairs level along with a very nice full bathroom with granite counters and tiled bath including a deep soaking tub. You’ll also find access to the two car garage.